Produced by Prabhat Film Co., under the direction of V. Shantaram, Amrit Manthan was released in 1934. Music by Keshavrao Bhole. The film was the screen adaptation of the novel “Bhagyashree” by Narayan Hari Apte. Produced in Hindi and Marathi simultaneously. A musical hit of all times, the film opposed human sacrifice to please the Gods. Blind beliefs on human sacrifice was the theme. Brilliant use of light and shade to visualize the scenes is a real attraction of which the opening scene is an example. An indication to stop blind beliefs like brutal practices of human sacrifice to please the Gods and Goddesses. The telephoto lens was used for the first time Indian cinema, especially on shots like the eyes of Rajaguru. This special effectwas used to show the hypnotic and mesmerizing power of the Guru. Chandra Mohan, Shanta Apte, Nalini Tarkhad, Suresh Mane, etc appeared in the lead roles. it was also Shanta Apte’s first adult role. 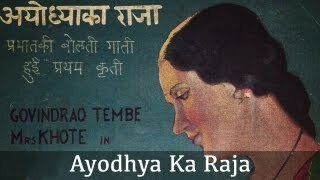 Indian Cinema’s first gazal in this film – “ Kamsini Mein Dil Pe Gham Ka…” by Shanta Apte. Prabhat’s first all India hit. Amrit Manthan was the first Indian film to celebrate Silver Jubilee.